Planning to Retire from Trucking One Day, Trucker? or the farthest thing from your mind. The image shown here portrays in very clear terms why we are addressing this subject. We want to keep you from being unprepared for retirement. Being unprepared for your retirement years means that you will have to depend on others for your livelihood. Sometimes that dependence leads to unpleasant consequences. We want to help you avoid that. If you have already started planning your trucker retirement, we encourage you to regularly re-evaluate your plan to make sure it will work for you once those trucker paychecks stop. If there was ever a reason to start planning to retire, that's it. Separately, we discuss the issue of being "forced to retire" from trucking and truck driving. The unforeseen things that can happen are all the more reason to plan -- or re-evaluate your plan -- to retire now. To plan while you still have options at your disposal is a good thing. Don't get so caught up in driving that you never get around to planning to retire. Have you ever seen childhood actors and actresses many years after their shows or movies were big hits? Did you notice how old some of them look? Have you considered how many years it's been since that show was on? If you're a trucker, it would serve you well to think about retiring from trucking before you have to rather than have trucker retirement "sneak up on you." Do your retirement planning during your earning years. Don't get so busy just living that you never get around to planning to retire. If Trucking is So Deadly, Why Bother? Since driving a truck for a living is one of the top 10 deadliest occupations in America, many truckers may wonder why they have to engage in planning to retire at all. Because many truckers have families who are counting on them financially. You do such a good job in planning your trips as a trucker, you owe it to your family to do a good job in planning to retire, too. We urge you to plan your family's financial future now. If you don't have a home support team to support, you can leave your financial legacy to a charity of your choice. There are always those who are more needy. If you're not currently saving money, you need to start. If you're deep in debt, you need to break free. How much money do you want to live on each month during your retirement years? We have selected a few amounts of money ($250, $500, $1000, $2000 and $5000) for monthly income -- what you're planning to retire on -- and calculated how much money you would have to have in the bank and what interest rate you have to get in order to earn it. Please note that interest rates are posted for illustrative purposes only; finding investment accounts that pay out on any of these bases may be rare. These numbers also assume that the value of the money in the bank has a fixed value. We know that inflation lowers the purchasing power of the dollar (or any currency). Again, these calculations are for illustrative purposes only. To get $250 per month retirement income, you need to have (as an example) $300,000 in the bank and earn 1% interest. To get $500 per month retirement income, you need to have (as an example) $300,000 in the bank and earn 2% interest. At the 1% interest rate, you need to have $600,000 in the bank to earn $500 per month. To get $1,000 per month retirement income, you need to have (as an example) $300,000 in the bank and earn 4% interest. At the 1% interest rate, you need to have $1.2 million in the bank to earn $1,000 per month. To get $2000 per month retirement income, you need to have (as an example) $300,000 in the bank and earn 8% interest. At the 1% interest rate, you need to have $2.4 million in the bank to earn $2,000 per month. To get $5000 per month retirement income, you need to have (as an example) $300,000 in the bank and earn 20% interest. At the 1% interest rate, you need to have $6 million in the bank to earn $5,000 per month. The interest rate your money is able to earn. ... The average annual pay for the nation's 1.51 million tractor-trailer drivers increased 1 percent last year to $39,830, the BLS data show. That's right, $39,830. The U.S. Bureau of Labor Statistics puts the wage at $37,770 per year. For now, we're going to base our calculations on the higher wage. How Much Can Truckers Save? It doesn't really matter how much other people are or aren't saving (link 1, link 2) because saving money on which you're planning to retire should be a very personal thing. So to help you in planning to retire, let's look at some hypothetical numbers based on the higher average annual income listed above. listing only dollars saved, with neither interest accrued nor the effect of inflation over time. $39,830 * 5% = $1,991.50, which you'll see below. At the average truck driver's pay, and saving 20% of your income for 40 years, you might be able to save $300,000 -- that is if inflation doesn't eat up its purchasing power. To get a better picture of your retirement savings, you may wish to experiment with a retirement calculator. If you like, you may search for one online. 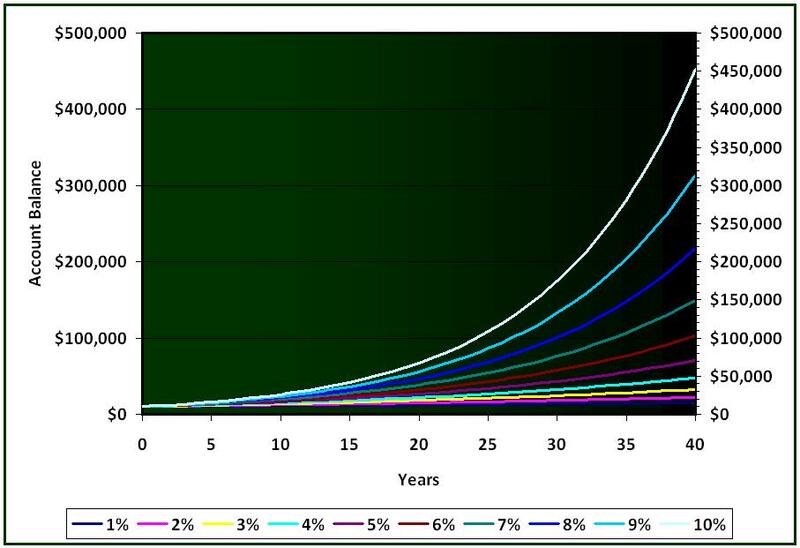 This image (link) shows the effect of compound interest, compounding yearly from $10,000 at various rates of interest. Obviously, the higher the interest rate you can get and maintain, the more money you can earn over time. In the table above, we didn't list any interest on the amount of money saved because any interest rate that we could list would be speculative. Where can you get even 1% or 2% interest on savings accounts these days? We're sure that some folks can get them. But are they available to every day folks like truckers? Even if they were available today, would they be available later on -- as in for the rest of your years in retirement? As you're planning to retire, be realistic about your calculations. We recommend that you consider the types of investment that will help you to preserve or grow wealth. Some people scrimp and scrape now in order to enjoy their savings later, only to never be able to enjoy them. Somewhat like the "hare" in the race with the tortoise, some people blow everything they have now, only to be caught shorthanded later. They think they'll be able to catch up later, only to arrive at the finish line without what it took to win. Striking the right balance of persistent saving is the "tortoise" in the race who won in the end. If you live in the USA, you may want to think long and hard about planning to retire on Social Security in your retirement years. "The average boomer is about $500,000 short on savings, TD Ameritrade reports. Only one in five Americans past 55 has saved as much as $250,000, according to the Employee Benefit Research Institute." "At the core of retirement planning is creating an income stream that will replace 80% of your final salary." The article does not mention having a second income or earning residual income from it. Money saving tip: If you do not have a budget, learn the benefits of developing your customized spending guide. If you're in debt, do all that is in your power to break free. If you are not in the habit of saving money, start -- even if it is just $5 per week. Develop the discipline. Look for savings, especially through ways of not losing money. Seek to simplify your life if you can. Remember your goals. Do you have items you no longer need, use or plan to use? Assuming the market is right for such sales, why not sell them? Get your home support team or a friend to help you. If you own your own truck, consider investing in aerodynamic improvements to help you reduce air resistance and therefore save fuel. Also, calculate the long-term savings you could reap from installing an APU on your truck. While you're planning to retire, it would be worth your time to consider having a second income upon which to depend, something that is "retirement-proof." Return from Planning to Retire from Trucking One Day, Trucker? to our Budgeting page or our Truck Drivers Money Saving Tips home page.